The province of León, in Spain, may look like a boring place at first (at least it did for me). I already knew that, because of my previous trip to walk part of the Road to Santiago, when I got the chance (thanks to the University I'm working for) of spending a week with my girlfriend in a residence for students at the capital, called León as well. I tried to dig a little bit and get as much information as possible to get the most of the trip. The best source I could get beforehand was a book that I borrowed from the public library: "Guía azul, el mundo a tu aire: LEÓN". I got more information later at the tourism office of León, but I would have preferred to get it through the internet before departing. Especially the maps. I don't understand why it is so difficult to find good quality maps in tourism websites. Thank god that the guys from Google created such an amazing software as Google Earth (and Google Maps). León means Lion in Spanish, but actually the name comes from something totally different. The Romans, to be specific the VI and VII Legio Gemina, settled their army in the same region that later would become León. The Romans, who extracted lots of gold from the mine now called Las Médulas, are a big part of the history of the region and its legacy is considerable. 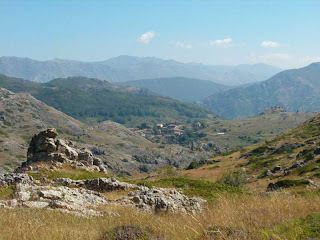 Besides the Romans legacy, there is another clear cultural attraction: "El Camino de Santiago" (the Road to Santiago). This ancient religious pilgrimage had (and still haves) a lot of influence in the region. In León, you can find a great heritage of churchs that were built along the Road. It really pays to contemplate in complete silence the interior of these old churchs. The Road is one of those experiences you must do by yourself if you want to understand it. Day 1 - Cris and me took an Alsa bus from Santander to León. By the time we arrived, we only had time to see the residence and rest from the journey. Our room was clean and comfortable. We were a bit disappointed though because we couldn't access the kitchen, especially the microwave. 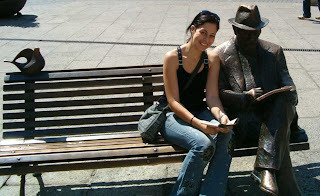 Day 2 - We spent the day walking the streets of León and seeing its main tourist attractions. 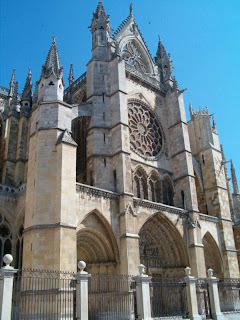 The catedral is probably the center of León and it is really beautiful. Around the Cathedral there is another beautiful building by Gaudí, "Casa Botines". In front of it there is this man and a pigeon standing in a bench. 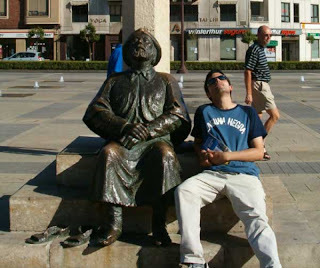 That is me resting besides the sculpture of a pillgrim in San Marcos. Day 3 - With the aid of Google Earth, I planned a hiking route to go to see the cave of Valporquero. We took a FEVE train from León to Matallana. Guided by my GPS, we climbed the mountain that led us to the cave. 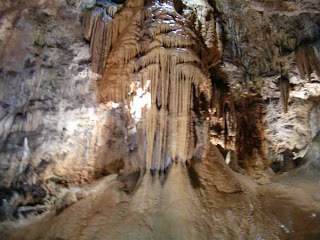 We bought a guided visit to the cave where we could contemplate fantastic geologic structures. 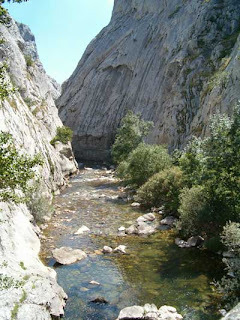 The return journey was made through the road that goes through the Vegacervera Gorges, in the picture. 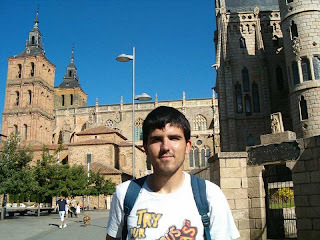 Day 4 - We needed to rest from the hiking route so we decided to stay in León. We went to visit the Museum of Contemporary Art (MUSAC) of León. The entrance was free. There was an exposition of pictures from China. 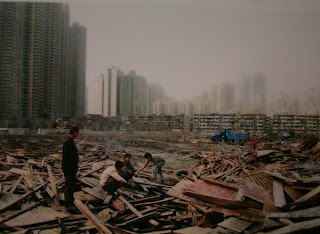 I like this one because it shows the past (see the temples on the left), present and future of China. 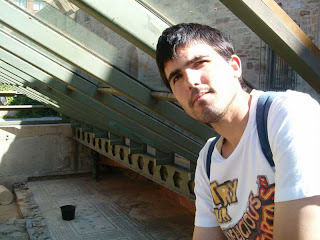 Day 5 - We made a visit to Astorga, another roman town. Like in León, the combination of a great cathedral and a building by Gaudí, are the most beautiful constructions of the town. We also saw ruins from the roman thermas and some beautiful roman mosaics. Day 6 - Our last complete day was for a visit to Ponferrada, in the west part of the province. 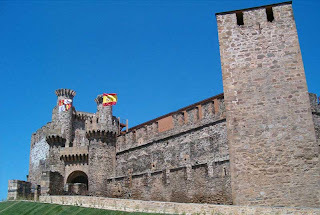 The major attraction of Ponferrada is its wonderful castle. This castle was built by a special group of monk-warriors, called Templarios, on top of the ruins of a roman prison. They protected the pillgrims during several centuries. Day 7 - We bought some typical desserts from the region and made time walking in León before taking the bus back to Santander. My conclusion after the trip is that the province of León owes a lot to the Road of Santiago. In that aspect, I am very critic with the city of León. They should provide a better way to enter and exit the city. Besides that, I found people from León very unpleasant. When we tried to ask for information they were very rude and stupid. Cars didn't respect pedestrians, even when the traffic lights were green for us (it looked like Italy!). Fortunately, Astorga and Ponferrada were clearly better in both aspects.